We the global family of the Indigenous People of Biafra (IPOB) and its leadership wish to alert the civilised world of recent savage statement and covert order to continue the killing of Biafrans in the guise of "clampdown on IPOB" from the Nigerian Chief of Army Staff Lt. General Buratai and other heads of security agencies. This order has resulted in the shoot at sight operation now going on across Biafraland especially in Abia and Ebonyi states. It’s on record that IPOB is a peaceful but determined liberation movement. It is equally known that our method is non-violent civil disobedience. That we have chosen to sit-at-home on 16 February 2019 does not in any way constitute a breach of the peace, only in the warped minds of Buratai and other entity begging Fulani Jihadists. These ongoing killings of innocent Biafrans, some of whom are kidnapped from their homes in the middle of the night or snatched in broad daylight from our streets is an act of war. Those who are silent in the face of this relentless provocation will have themselves to blame when the time comes. That Nigerian Army and other security agencies headed by Fulani Jihadists have decided to start another round of brutal clampdown against innocent people in Biafraland is condemnable. This is renewal of the genocidal strategy this same army carried out in 2017 with the active connivance of Igbo governors and Ohaneze Ndigbo. 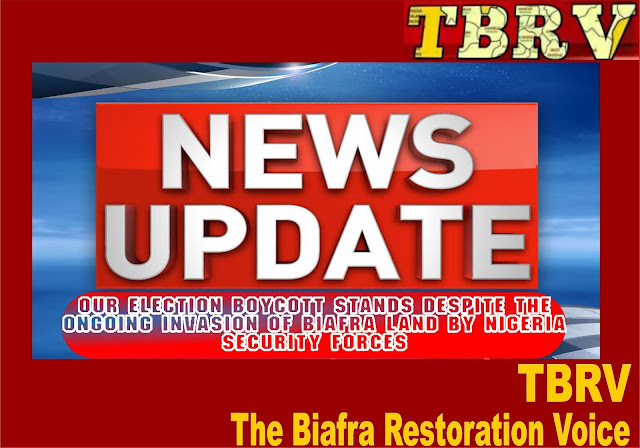 That Biafrans have decided not to participate in Nigeria's presidential elections by sitting at home does not in any way constitute election disruption. How Buratai and his handlers could have construed peaceful sit-at-home exercise to mean disruption of elections is defies logic and common sense. Since the announcement and beginning of this latest version of Operation Python Dance 3 by Nigeria Government and her security forces, people have been missing from their respective houses while some are no more attending to their legitimate businesses for fear of being kidnapped by the army, police and DSS. Many kidnapped victims are languishing in secret police cells and army detention facilities in Obinze near Owerri in Imo State. Innocent people that never committed any crime against anybody or state are being slaughtered and their burnt lifeless bodies once again thrown into a borrow pit along Aba Umuahia expressway near Magazine Fuel Station in Aba, Abia State. It is imperative we notify the general public and the world at large that Buratai in concert with Okezie Ikpeazu, David Umahi, Willie Obiano, Rochas Okorocha and Ifeanyi Ugwuanyi and Ohaneze are still collaborating with the Fulani Jihadist to continue to exact what could only be termed the final solution for Biafra agitation. Our decision to boycott next week's election is set in stone. No amount of cheap propaganda by professional political e-rats, Nigerian Army or Fulani slaves in Biafraland can alter our resolve to boycott this coming presidential election unless our simple demands are met. It is important humanity is duly notified through this statement that Nigerian Army have no justifiable reason whatsoever to invade South-East and South-South because we will be sitting indoors in our homes. Our resolve to restore Biafra remains non-negotiable and nothing can stop it.